Now Archived! PolarConnect event with Jennifer Bault and researchers Hongjie Xie and Yongli Gao studying Seasonal Ice Production in the Ross Sea in Antarctica. You can access this and other events on the PolarConnect Archives site. Sea ice in the the Ross Sea. Photo by Lollie Garay. In situ measurements and airborne surveys of snow depth and sea ice thickness are key for improving estimates of sea ice production and water mass transformation in the Ross Sea. The principle objective of this scientific expedition based on McMurdo Station is part of the PIPERS: Polynyas and Ice Production in the Ross Sea, project to fully capture the space/time evolution of the air-sea-ice interactions initiated during autumn and tracked into winter/spring in the Ross Sea. This project will collaborate with a New Zealand team to measure snow and ice thickness of the fast ice in McMurdo Sound, for validation of sea ice thickness imaged from airborne IcePod’s Shallow Ice Sounding Radar, and also mapping pack ice thickness and types from IcePod’s lidar, visible and thermal cameras. These data will be compared with ice thickness measurements from NASA’s IceBridge mission in the Ross Sea to extend the sea ice thickness measurements in this region to multi-years. PolarTREC teacher Jennifer Bault will be a full participant in sampling and conducting geophysical field measurements of the snow and ice, with a possibility to get onto IcePod flights to watch the scientific data collections from different types of sensors onboard IcePod. 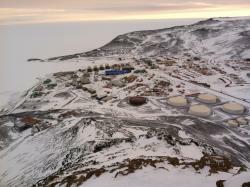 A view of McMurdo Station from Observation Hill. Photo by Michael League. The PolarTREC teacher will be stationed in McMurdo Station and will travel to nearby fast ice, ice shelf, mountain and glaciers to gain first hand experiences of the Antarctic cryosphere. 11 December 2017 Home At Last! 28 November 2017 Longest Day Ever! 26 November 2017 Final Long Hike and Science Talk! 25 November 2017 Thanksgiving in McMurdo! Newspaper article from the Grant County Herald Independent about Jennifer Bault's expedition to Antarctica. Concordia University WI E-Newsletter with article about teacher Jennifer Bault in Antarctica. - Jump to Journal - 22 November 2017 Ross Ice Shelf Meets... 6 February 2017 The Invitation 6 February 2017 Can I Really Do This? 7 February 2017 Arctic Ground Squirrel... 12 February 2017 Final Days! 11 June 2017 San Antonio, Fun In the Sun 13 June 2017 It's a Small World... 18 June 2017 San Antonio Complete! 5 October 2017 15 Days and Counting! 15 October 2017 Last Days at Nicolet! 21 October 2017 I'm Off! 23 October 2017 Another Trip Around the... 24 October 2017 Extreme Cold Weather... 25 October 2017 On the Ice! 26 October 2017 Albert P. Crary and the... 27 October 2017 Antarctic Field Safety... 28 October 2017 Snowmobile Training! 29 October 2017 Journey to New Zealand... 30 October 2017 Learning Can Be Fun! 31 October 2017 Happy Halloween from... 1 November 2017 Shakedown! 2 November 2017 Discovery Hut 3 November 2017 Mt. Erebus 4 November 2017 Fun in the Field 5 November 2017 Observation Hill 6 November 2017 Ice Coring in the Field 8 November 2017 Spotlight: Greg Neri,... 9 November 2017 Diving Unlimited! 10 November 2017 A Glimpse Under the... 11 November 2017 Lab Work! 12 November 2017 Finally...Penguins! 13 November 2017 Hiking Around McMurdo 14 November 2017 Rosetta Ice Pod 15 November 2017 Art in Science! 16 November 2017 Weddell Seals, Sea Ice... 17 November 2017 Staying Warm in... 18 November 2017 Castle Rock Hike 19 November 2017 Pressure Ridge Tour 20 November 2017 Life at McMurdo 21 November 2017 Scientists of McMurdo 23 November 2017 Terra Nova Hut, Cape... 24 November 2017 Hongjie and Yongli 25 November 2017 Thanksgiving in... 26 November 2017 Final Long Hike and... 27 November 2017 Going Home 28 November 2017 Longest Day Ever! 11 December 2017 Home At Last! Jennifer developed her love of nature and science at a young age, a result of spending time on her parent’s farm and from many family camping trips around the US. She became a third generation teacher in 1997 and has never looked back. Teaching is a natural fit for her due to her own love of learning. She teaches AP Environmental Science and AP Biology at Nicolet Union High School just north of Milwaukee, Wisconsin. She holds a Masters in Curriculum and Instruction and a principal’s and C & I director’s license. She is looking to complete a PhD in Environmental Science with a concentration in Science Education Research. Most recently, Mrs. Bault traveled to Nzega, Tanzania in 2014 with CETUSA and completed American Wilderness Leadership Training in Wyoming in 2015. Every experience makes its way into her classroom and enhances her teaching and interactions with her students. She also loves to engage her students in learning experiences outside of the classroom through a variety of field trips, including an outdoor education overnight camping trip. Jennifer is an avid hiker and enjoys camping, reading, and traveling with her husband and two teenage daughters when not in the classroom. Hongjie Xie is a professor at the Department of Geological Sciences, University of Texas at San Antonio. His specialty is remote sensing for hydrology and cryosphere studies. In-situ measurements and field experiences are crucial in helping scientists to understand and interpret what we see from the satellite images and to develop and improve algorithms for retrieving geophysical properties of objects imaged from satellite sensors. Since 2006, he and his research team have been traveled (over 10 times) to the three Polar Regions (Arctic, Antarctic, and Tibetan Plateau) for data collections and experiments. His main research focus has been on mapping sea ice, snow cover, glacier lakes and their changes under the warming climate. Since 2010, he has been a co-lead (funded by NASA and U.S. Department of Education) for summer workshops, specifically designed for K-12 educators to gaining knowledge on earth and environmental science/engineering, including the polar science and climate changes. Stephen Ackley is a research associate professor at the University of Texas at San Antonio, and has worked and conducted sea-ice research in Antarctica for more than 30 years. He previously worked with the Cold Regions Research and Engineering Laboratory (CRREL) and then joined the Department of Earth and Environmental Science at the University of Texas San Antonio in 2006. Ackley Point in Antarctica was named to honor Ackley for his outstanding sea-ice work by the U.S. Board on Geographic Names. 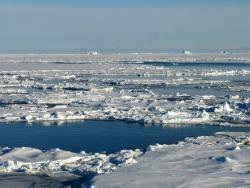 Ackley Point is an ice covered point located near McMurdo Sound. I have thoroughly enjoyed viewing your amazing trip. Will be nice to see you!! !